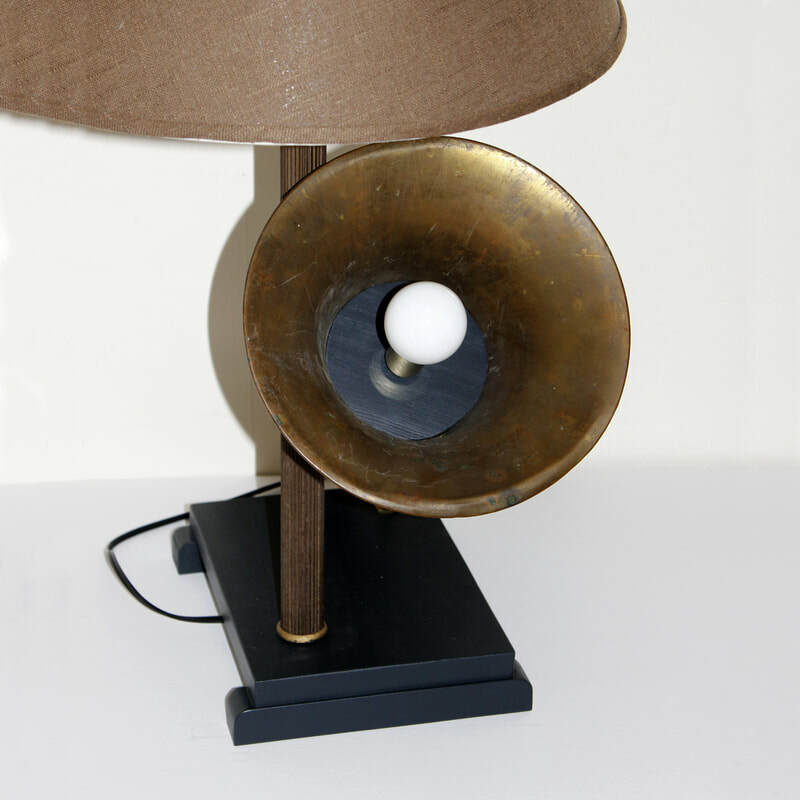 LAMP REVIVAL offers a unique collection of recycled lamps created from found objects. 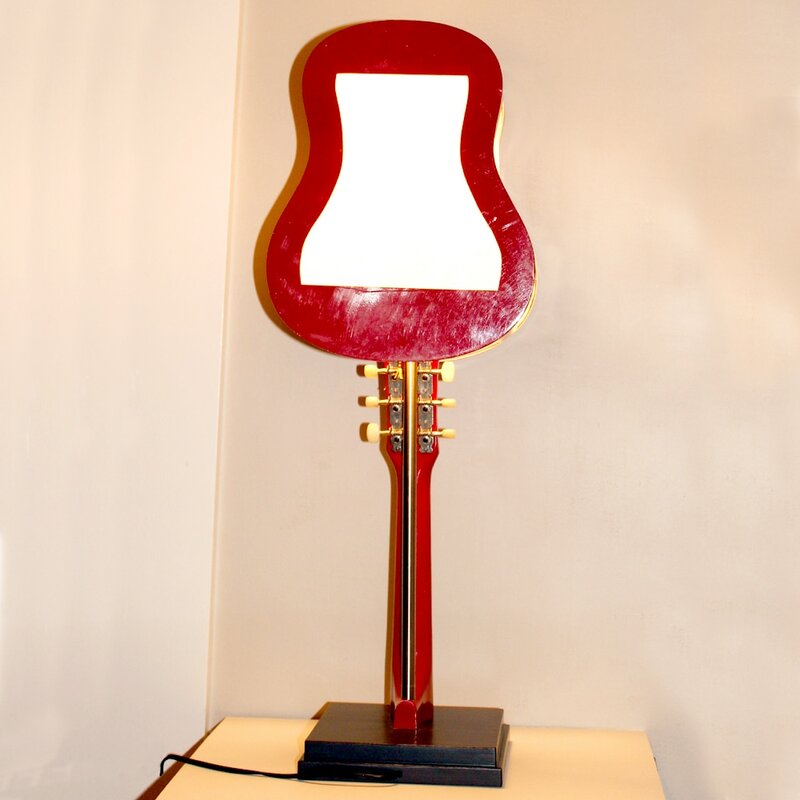 Most are one-of-a-kind lamps dependent on material availability. 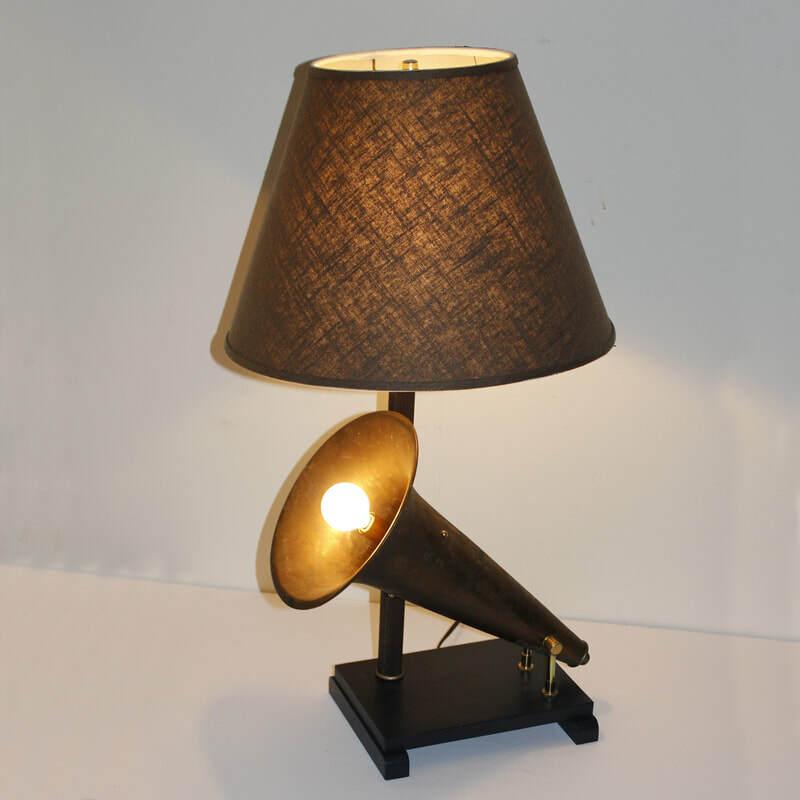 Musical instrument lamps are the most popular of the found object lamps. 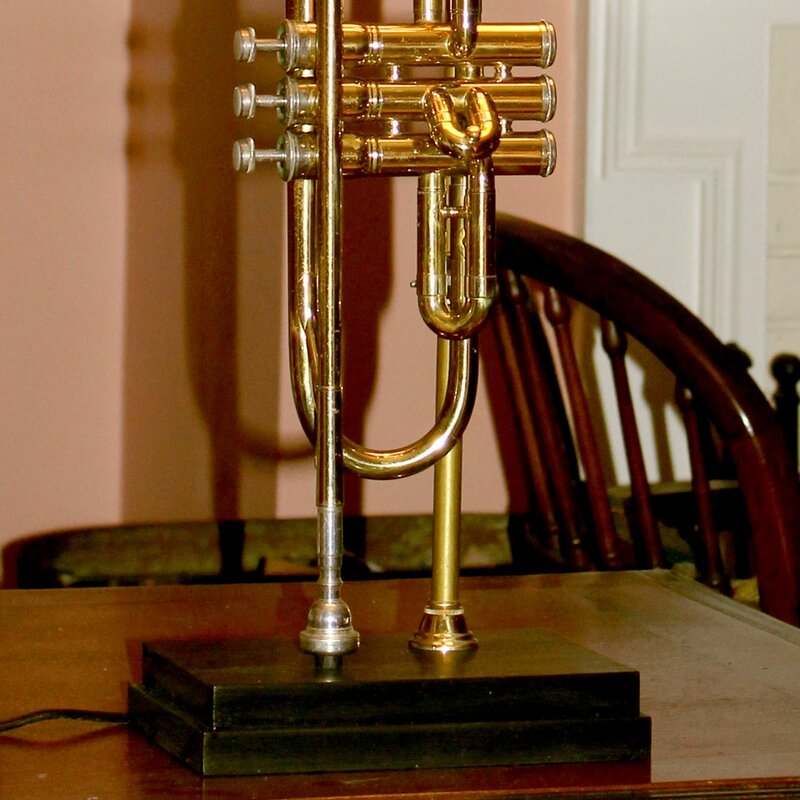 A euphonium is a valved brass musical instrument resembling a small tuba of tenor pitch, played mainly in military and brass bands. 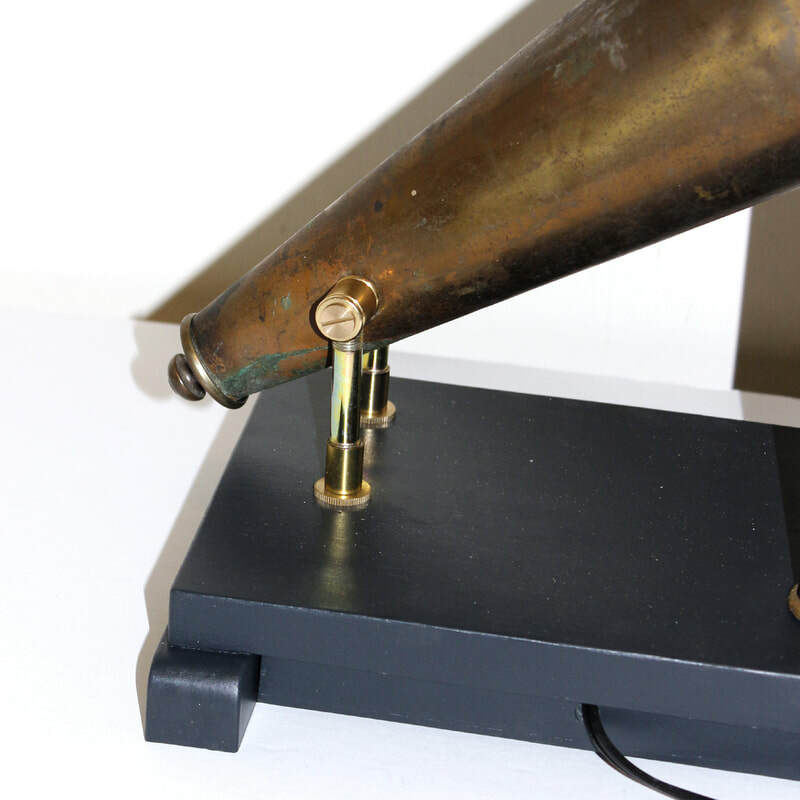 The name is derived from an Ancient Greek word meaning "well-sounding" or "sweet-voiced." 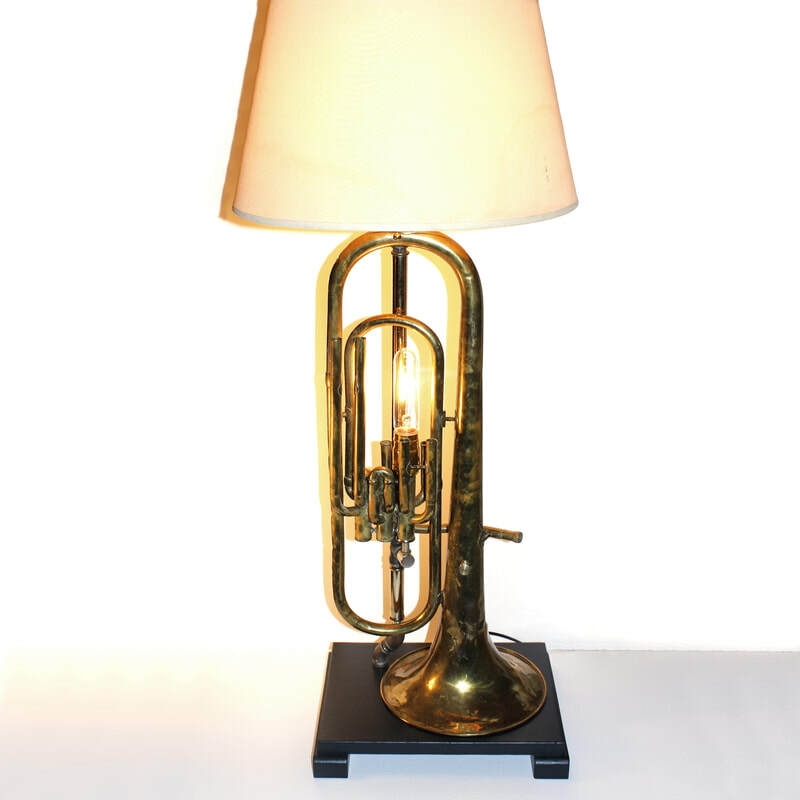 This handsome large lamp was crafted from a somewhat battered and scared euphonium retrieved from a second hand shop in Maine. Some missing parts add to the authentic vintage appearance. 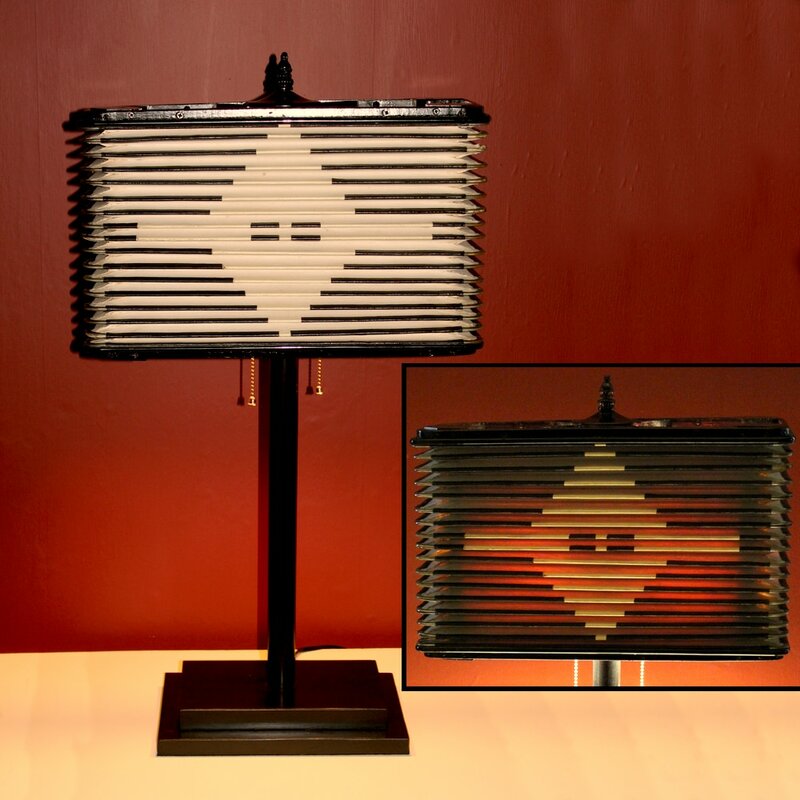 This repurposed lamp is mounted on a hand-crafted black wood sled rail base, and features a 3-way turn knob socket switch that first turns on only the lower tubular bulb, then only the upper shade bulb and finally both bulbs. 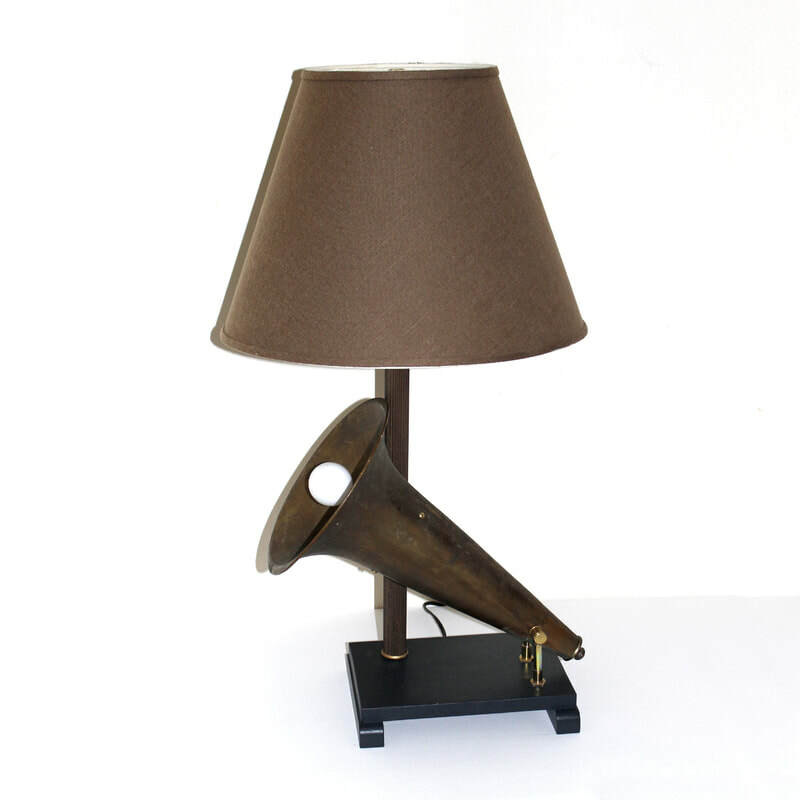 Lamp comes with both bulbs, an 11” harp and finial, but SHADE IS NOT INCLUDED. Height to top of 11” harp and finial is about 40 inches. Base is 12-3/4 x 10-1/4 inches. 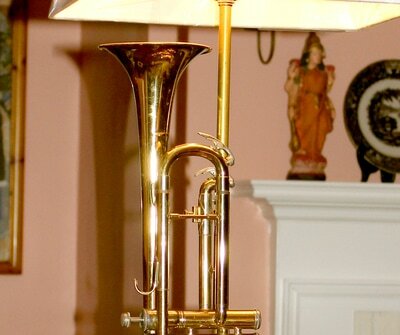 Euphonium is approximately 24-1/2 inches tall with an 8-1/4” diameter bell. 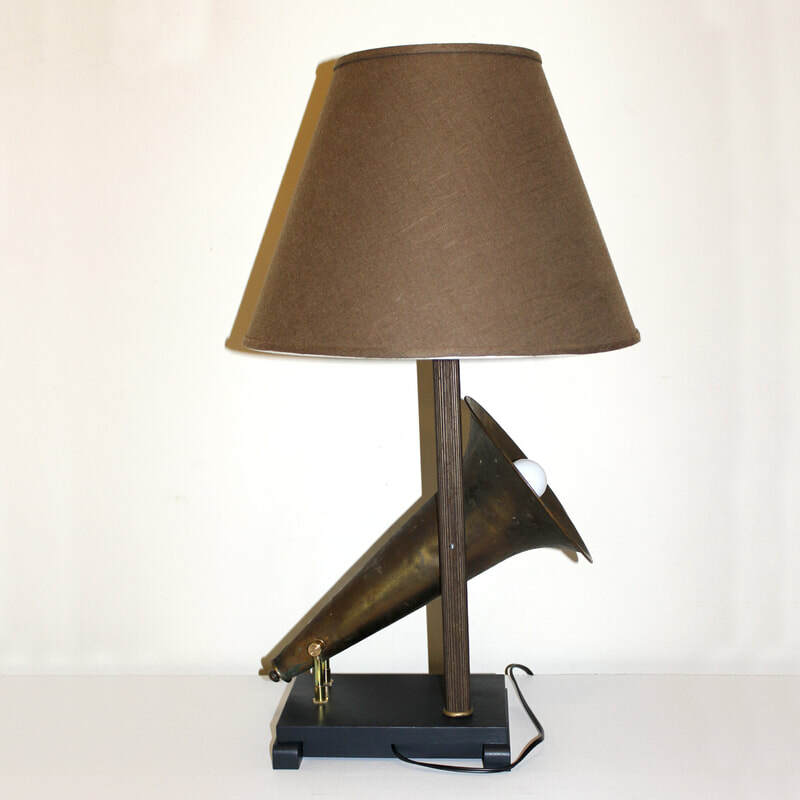 A vintage brass phonograph horn makes a perfect found object lamp. 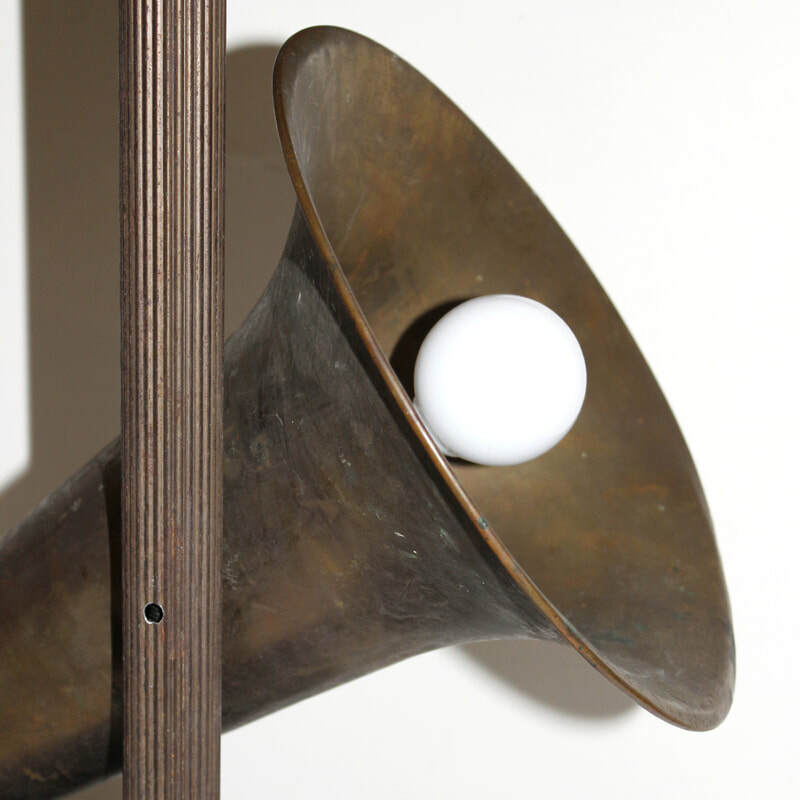 The well-worn brass horn, retrieved from a dusty old barn in Maine, is mounted on a hand made wood base with sled rails. 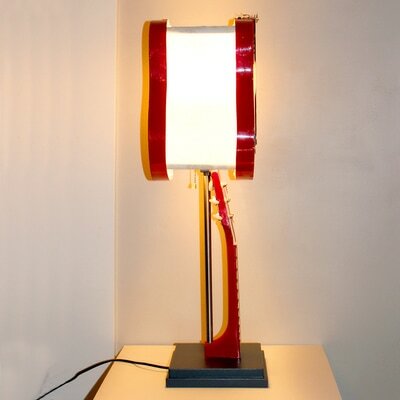 The 3-way turn knob switch on the upper socket first lights only the horn bulb, then only the upper bulb and finally both bulbs. 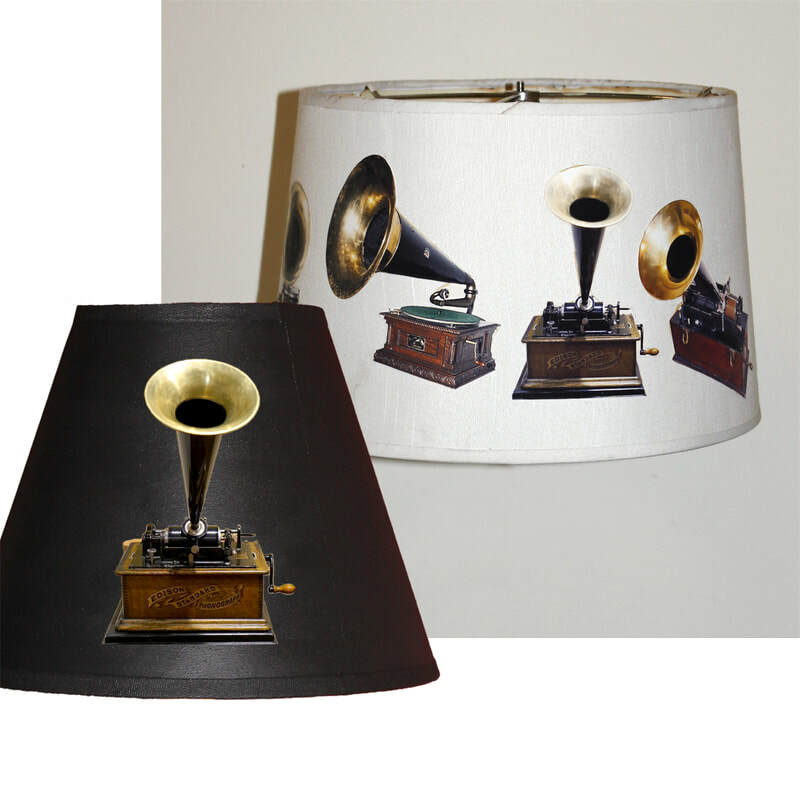 Sold with 10” harp, finial and both bulbs, but SHADE IS NOT INCLUDED. 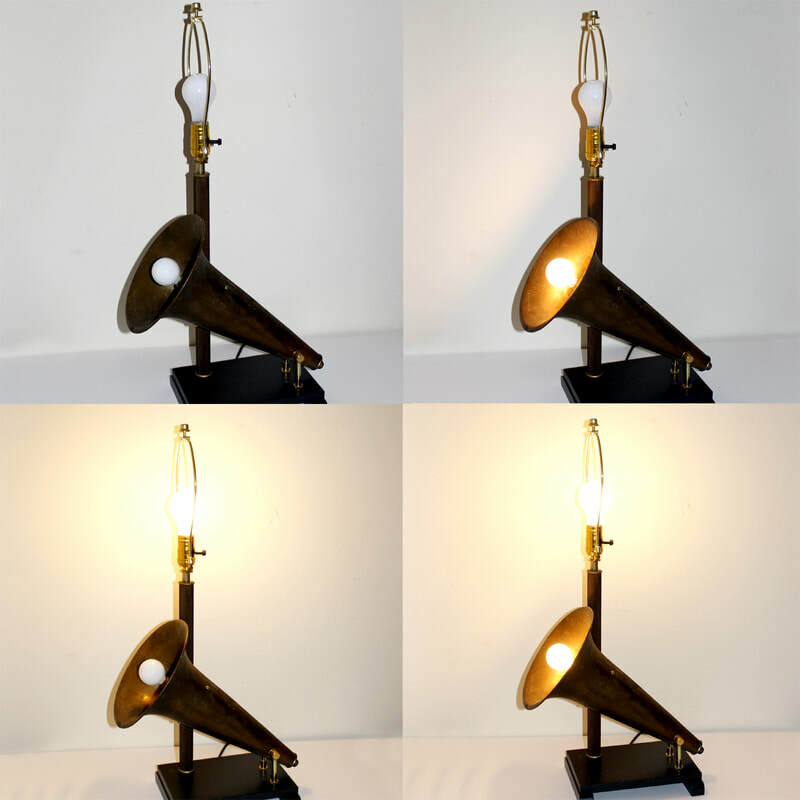 The lamp is shipped with a 2 inch diameter globe bulb in the horn, but the buyer is encouraged to try other interesting bulb types: larger globe bulbs, flame bulbs, silver crown, clear or frosted, as well as antique filament bulbs. 14-1/2” wide x 9-1/2” depth. Horn dimensions: 9-1/2” diameter x 15” long. 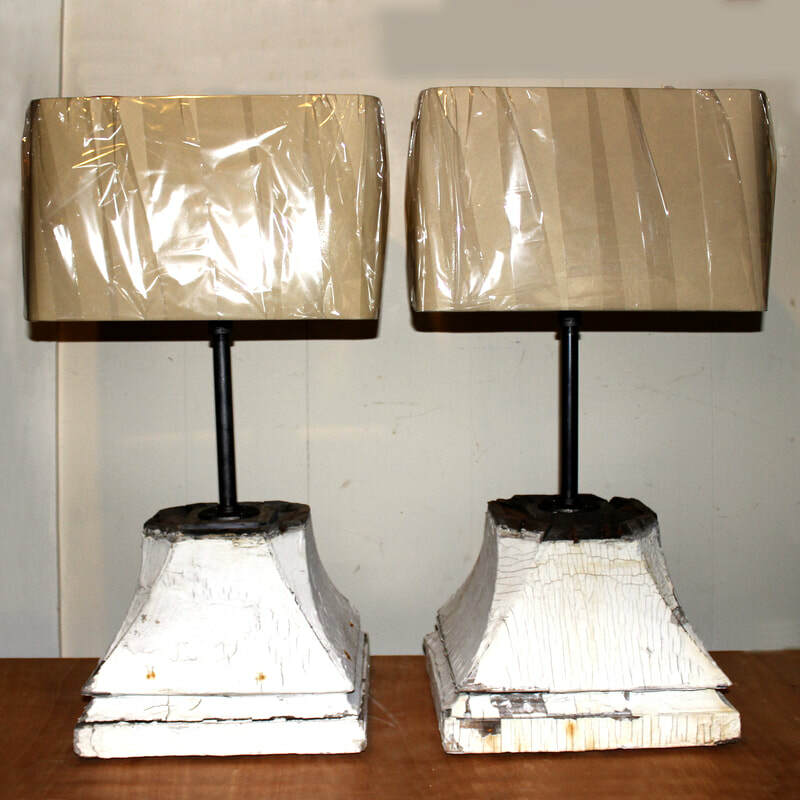 These table lamps made from recycled column bases offer a great crumbling architectural look. Peeling paint, distressed wood and central iron pipe stems add to their eclectic presentation. Includes harp and finial. 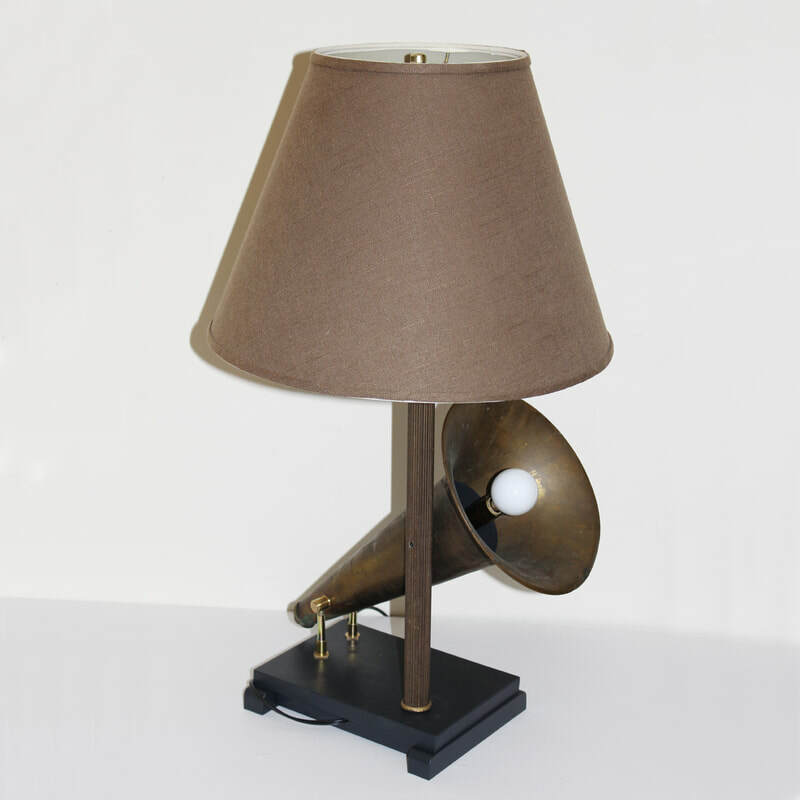 Beige linen shades SOLD AND SHIPPED SEPARATELY. 33 inches tall. 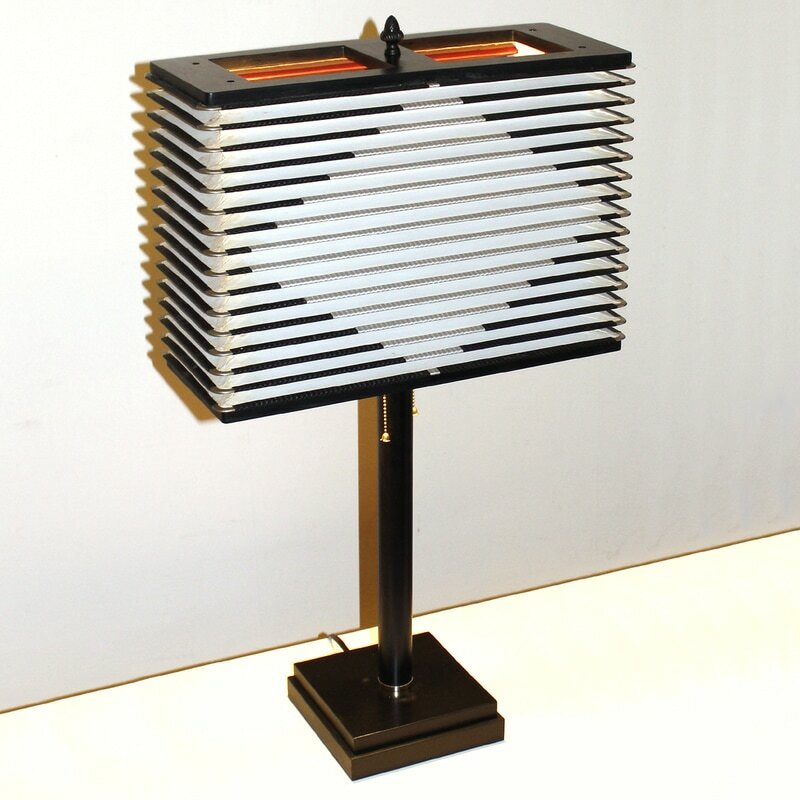 Base: 13x13x11 inches; Shades: 11x16x11 inches. 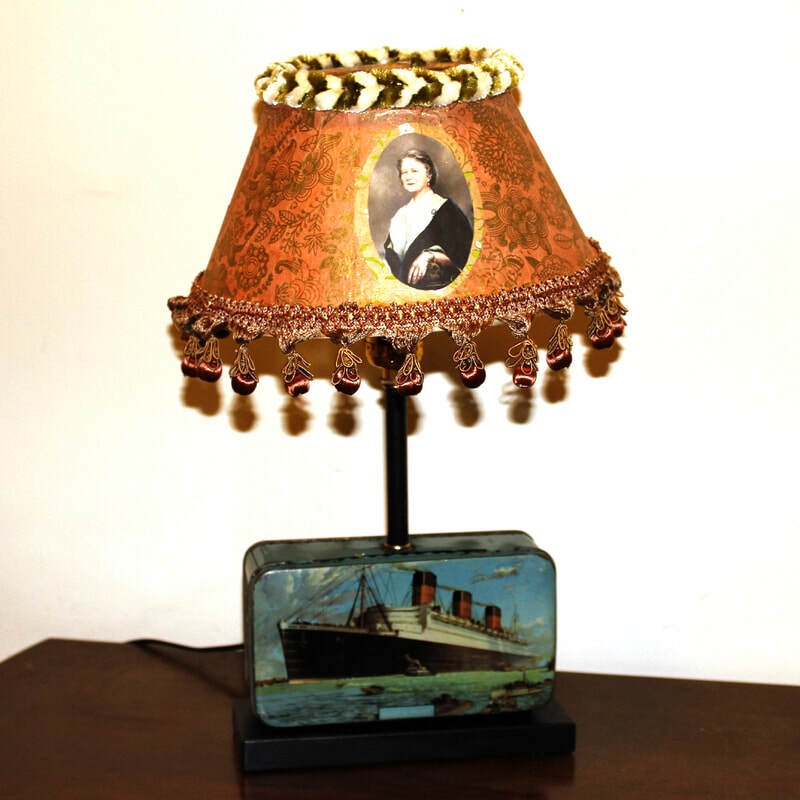 Children’s toys can be saved for younger siblings, or upcycled into nursery lamps. 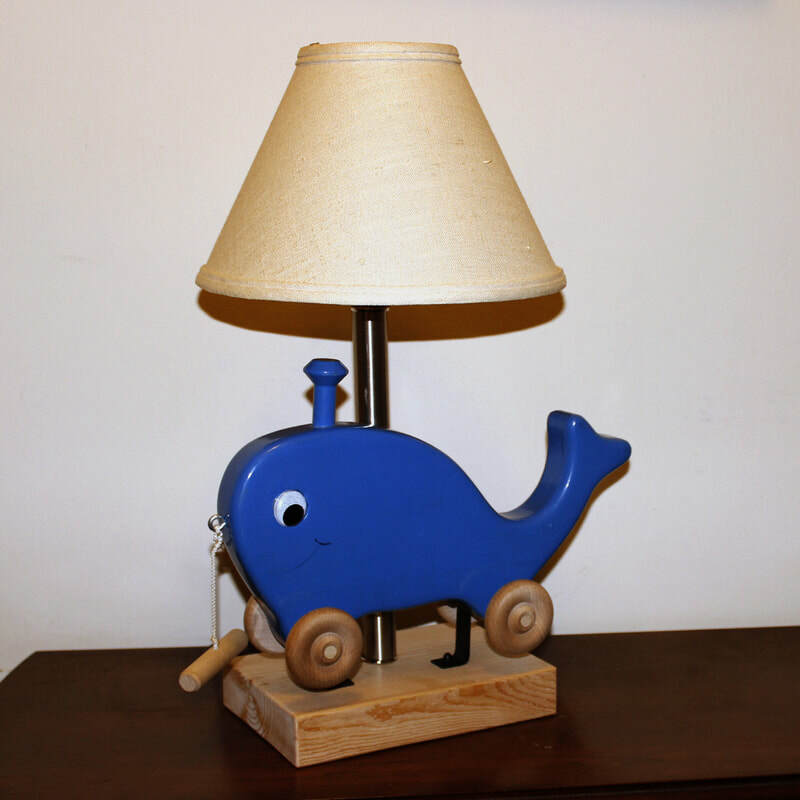 This beloved but quickly outgrown whale pull toy has been converted into a table lamp well suited for a child’s room or nursery. 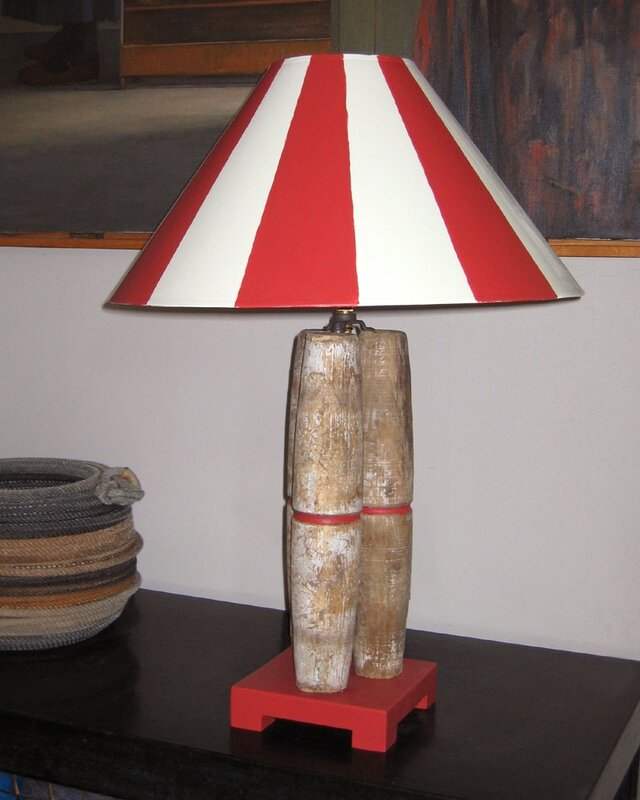 The whale and silver center stem are mounted onto a handcrafted unfinished wood base. 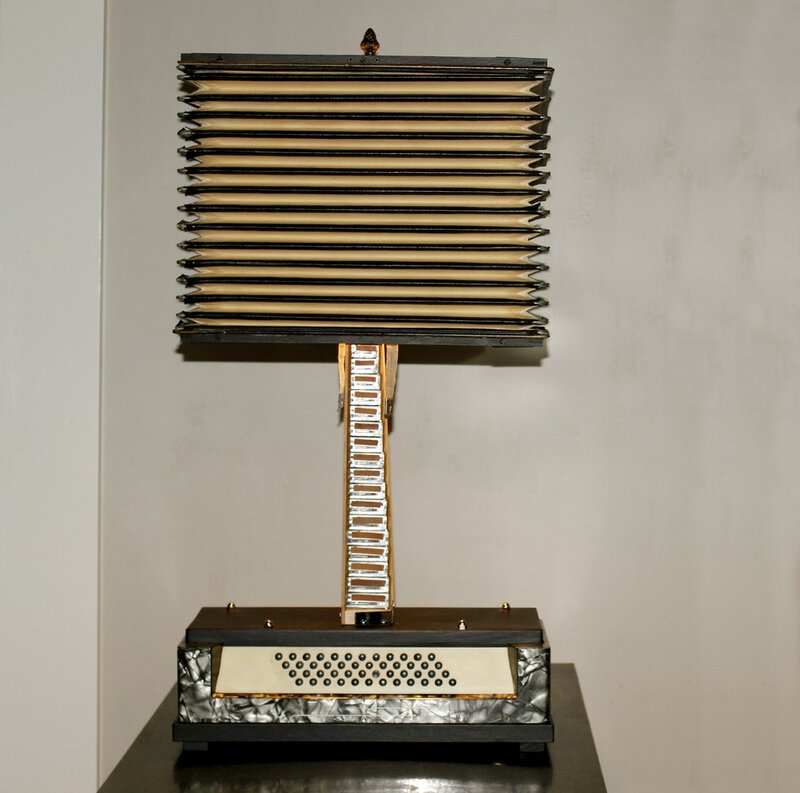 19 inches tall. Shade is NOT included. 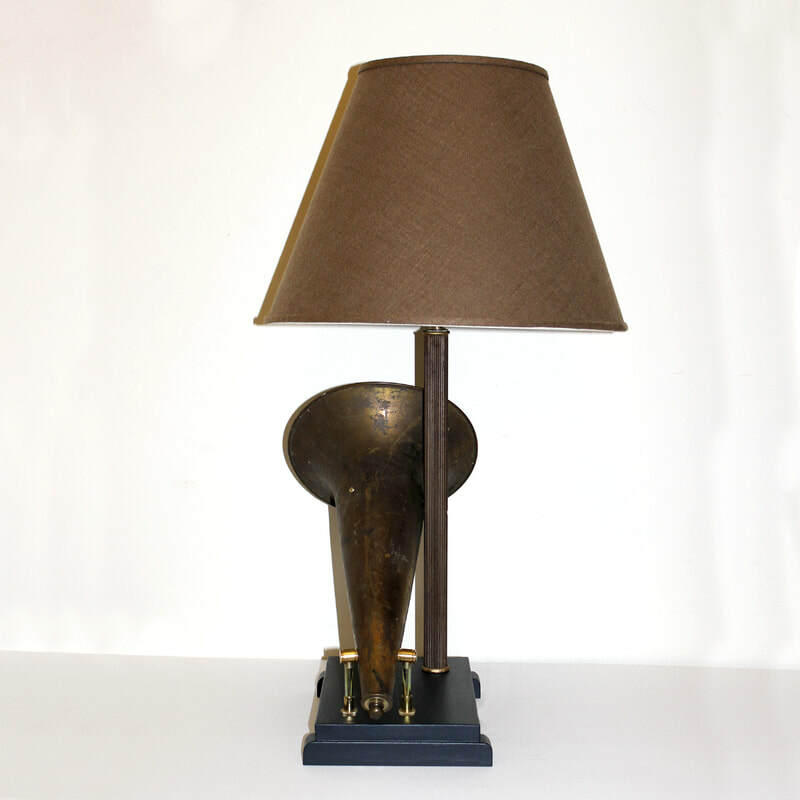 Musical instrument lamps are always in demand, but this exceptional brass trumpet lamp will resonate in your conservatory or living room. 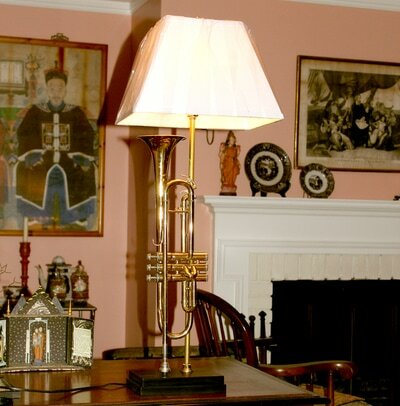 Vintage King Cleveland 600 trumpet (Serial # 542739) on a hand made stepped wood base. 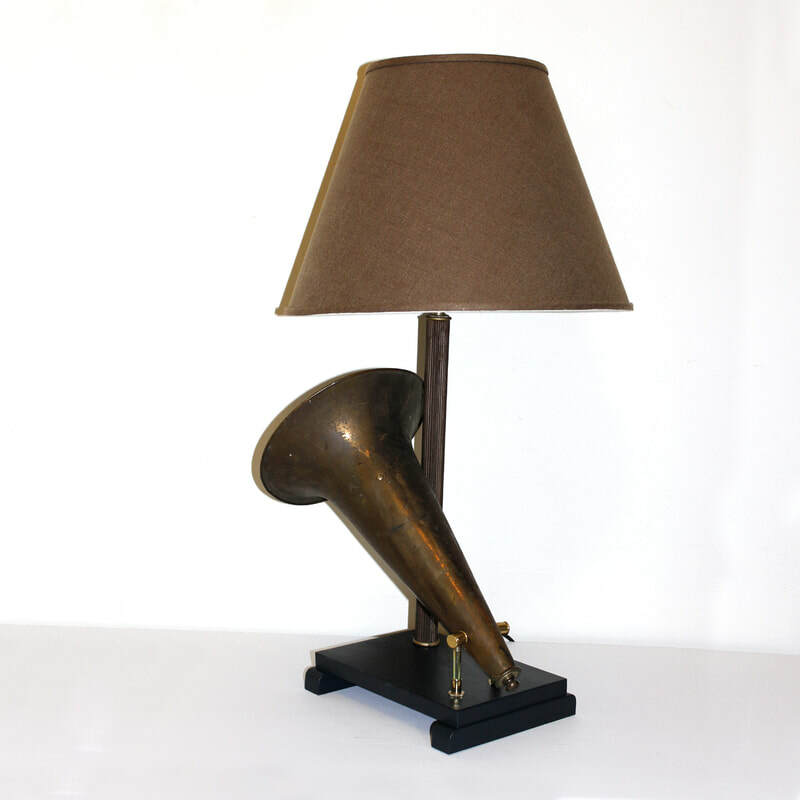 Unique "horn up" design. Trumpet 22 inches; lamp 35 inches. 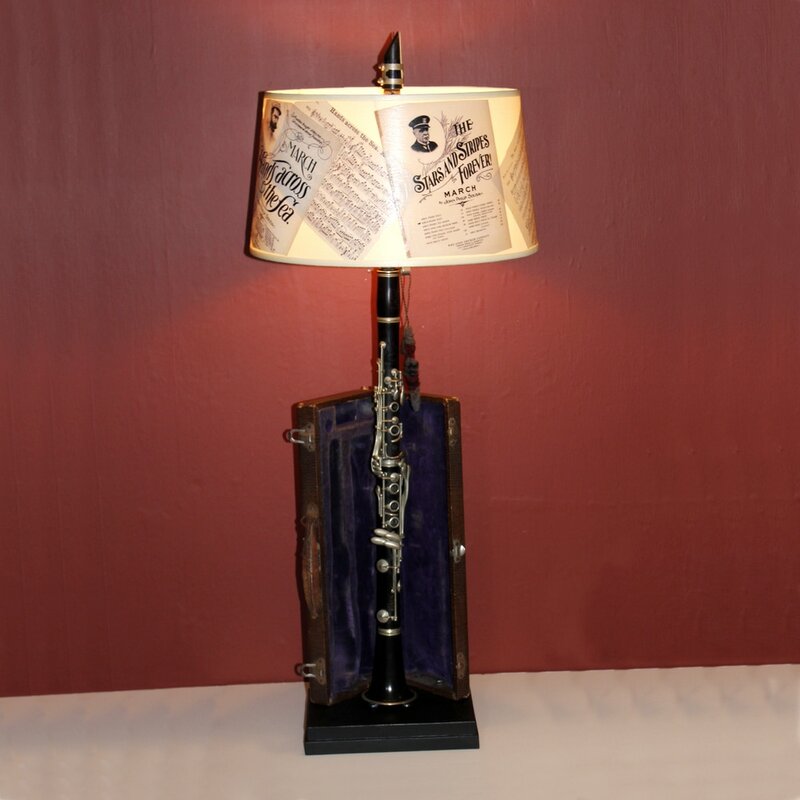 The squeeze box from old accordions make a fabulous lamp shade. 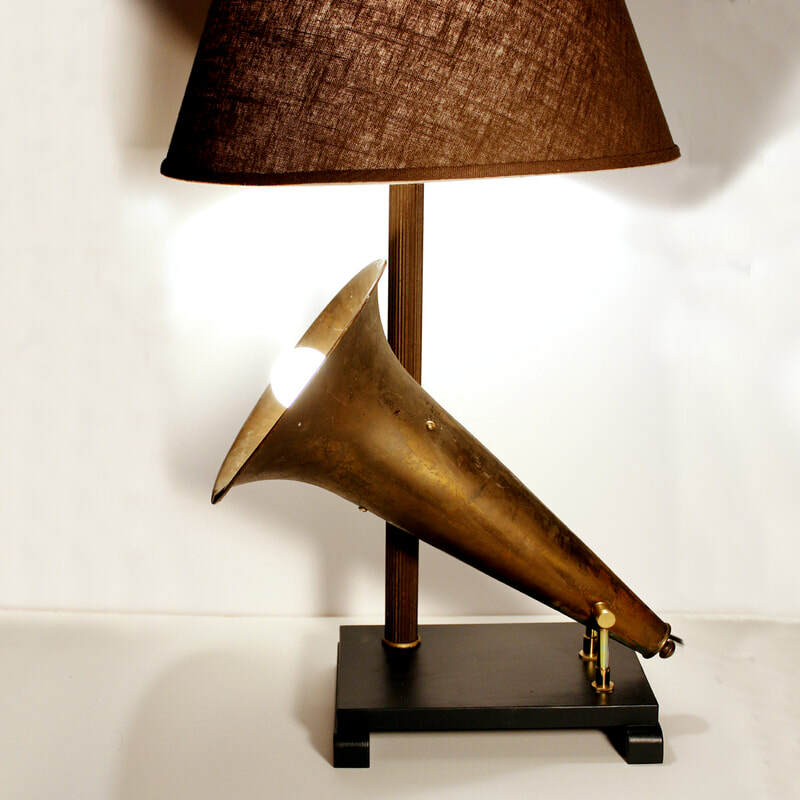 Another recycled musical instrument lamp from Lamp Revival. Starting with a downsized Disney Pixar "Cars" Acoustic Guitar By Washburn, the neck has been severed from the body, which was split to form the front and back of the fabric-lined shade. As a prized collector’s object or for rock star wannabes, the lamp adds a bold decor statement. 31 inches. 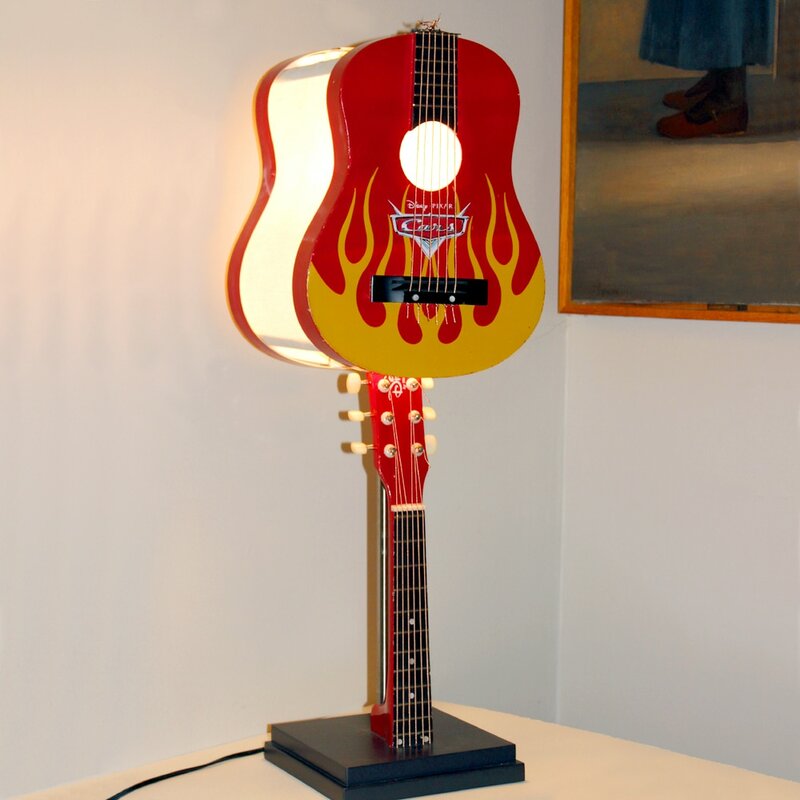 Table lamp created from three totally distressed candle pins on a wood base, with a custom hand painted shade. 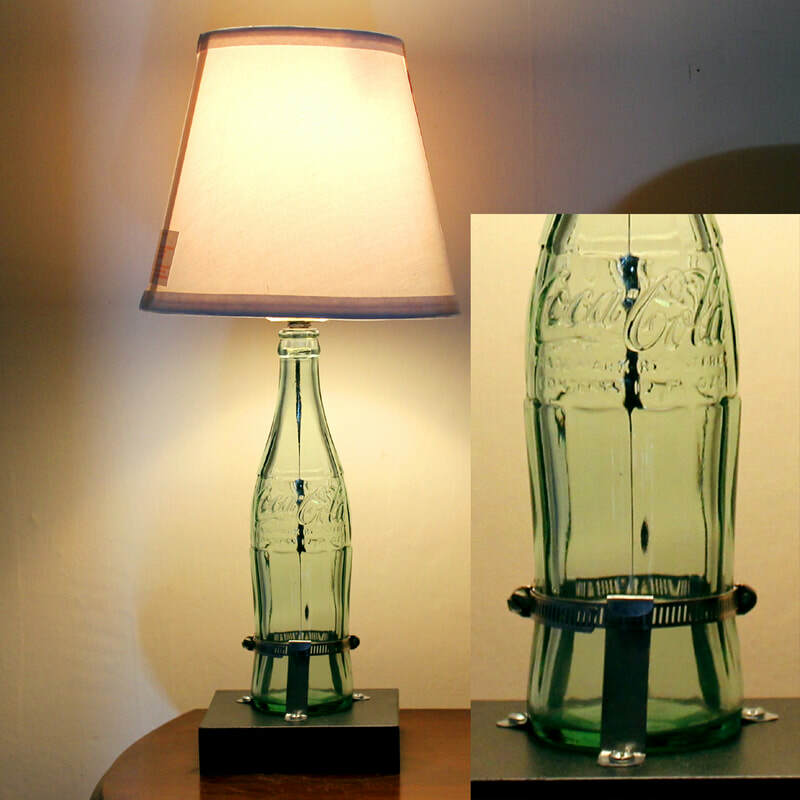 Small recycled table lamp made from a vintage embossed green glass Coca Cola bottle. A rare large 12 oz bottle mounted on a black wood base. 18 inches. Shade not included. 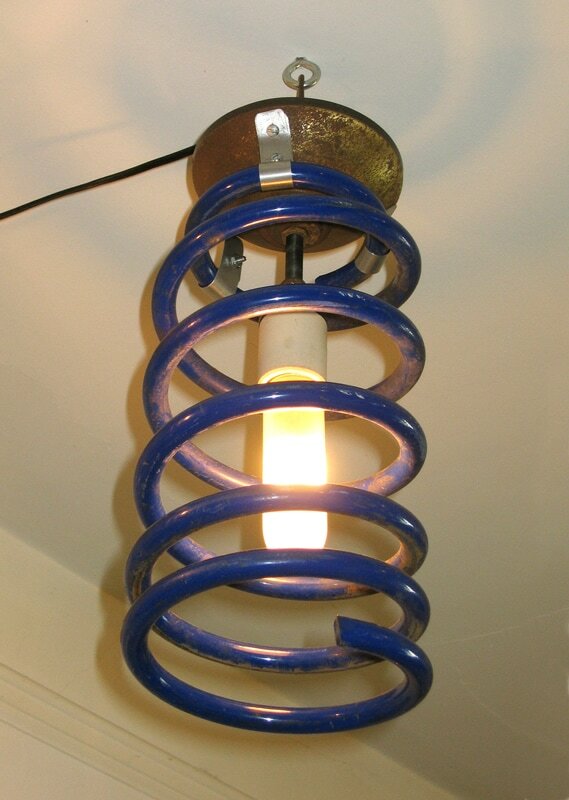 Recycled ceiling light from salvaged industrial strength spring, perhaps from automotive origins.